We work individually with you to create custom bookshelves that are designed to integrate seamlessly into your space, intelligently planned for how you live and what you need to store. Shelves can be made to any height or depth, and worked around columns, odd corners, or other architectural structures. They can be integrated with desks, benches, fireplaces, AV components, or other items. Like all our woodwork, our bookcases are made to the highest standards of craftsmanship; handmade by expert craftsmen in our Brooklyn studio. All wood finishes, such as paint or lacquer, are applied in-house, and installation is done by our talented craftsmen. The end result is a custom bookcase that is designed to meet your needs long after we have left. 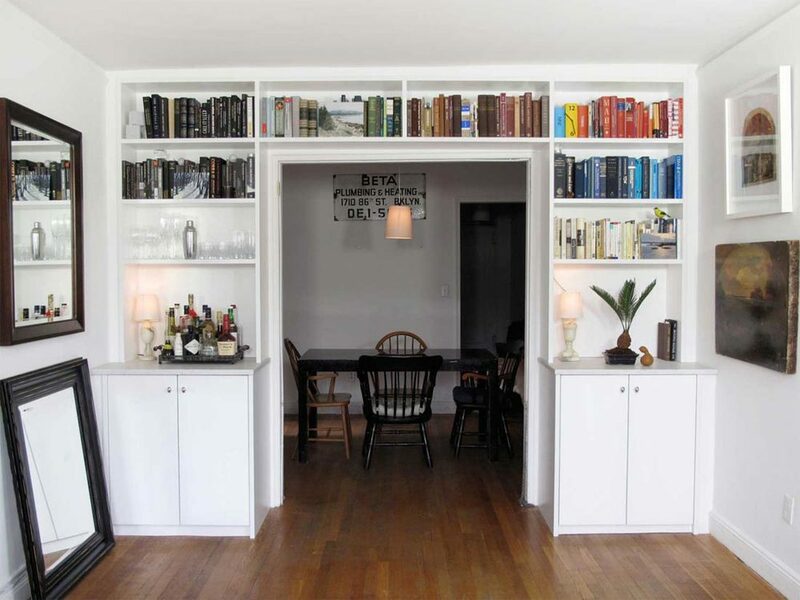 These bookshelves were made to incorporate a built-in marble-top desk for two people. They feature built-in light light sconces to illuminate the shelves from above. Both the bookshelves and the base of the desk were made of stained white oak. See more of this office. This project was for a couple with an extensive book collection on the bottom two floors of a classic townhouse. Floor-to-ceiling bookshelves were built into the hallways and around the living room fireplace. See the home office for this space. These built-in bookshelves have metal supports that fit into tiny slots that allow the shelf heights to be adjusted. Built-in bookshelves surround the fireplace. This project was for a family that wanted to incorporate modern built-in bookshelves to complement the pre-war details of their Brooklyn brownstone. All the shelves here are adjustable. These particular shelves look like fixed shelves because all the metal supports are concealed in slots. LED lights behind the bookshelves light the tops of the shelves to provide ambient lighting.